The Finding Aids site for Princeton University Library’s Department of Rare Books and Special Collections has been completely overhauled and enhanced with many new features to make it easier to search through our holdings. 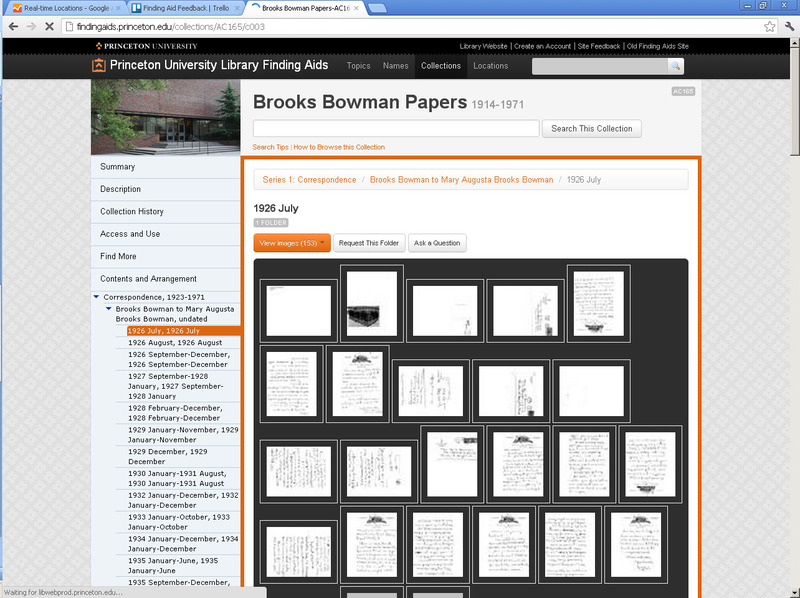 “Thumbnail View” of image browsing feature in the new finding aid interface. • Better options for users to contact the library and connect with each other, including an “Ask a Question” (for reference requests) and a commenting feature for users wishing to request an enhancement to the description or discuss the content of the collection. • Ability to place online requests to view material in our reading rooms. • A much cleaner, and more modern, look and feel. Several instructional videos which provide information on using the site are available online. We will be adding to the videos in the coming months. General help topics are also available, via the Special Collections Research Account Website. A number of Department of Rare Books and Special Collections staff, including Maureen Callahan, John Delaney, Regine Heberlein, Dan Santamaria, and Don Thornbury, collaborated with Jon Stroop and Shaun Ellis of the Library’s Digital Initiatives Group in order to develop the new interface. It builds on descriptive data created by dozens of staff involved with aggressive processing and data conversion projects over the last seven years. We’re very proud of the results and think it is one of the most advanced archival access systems available anywhere. We welcome your comments and questions through the “site feedback” link which is at the top of every page or the commenting feature available on finding aids themselves. 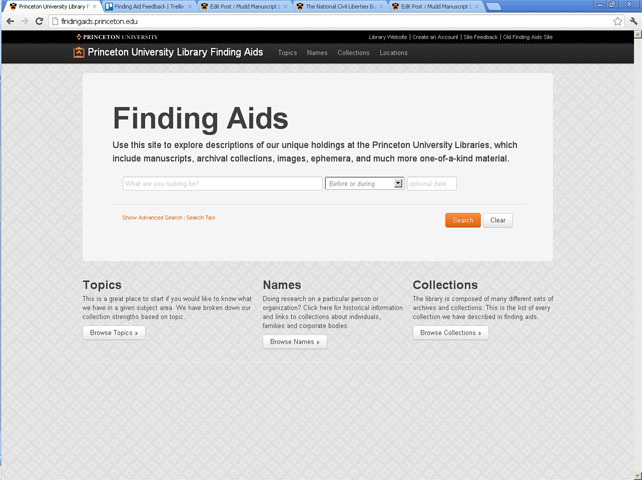 We hope you’ll use the finding aids as much as possible in your work and we look forward to your feedback. This entry was posted in Digital Collections, New Finding Aids, Presentations and Professional Issues and tagged Digital Finding Aids, finding aids by Dan Santamaria. Bookmark the permalink.